HR benefits staff for an organization involved in sponsoring and managing group health plan benefits for its employees. HR benefits staff for employers who sponsor group health plans (self insured and fully insured) for their employees such as medical health plans, dental, vision, flexible spending accounts, etc. HIPAA compliance for an organization revolves around protecting the privacy and security of Protected Health Information (PHI) that the organization has or will have access to. PHI is any information that can be connected to an individual's health condition. safeguards for keeping protected health information specifically in electronic form (computers, networks, email, software, electronic transmissions, etc) safe from disasters, hackers, and electronic theft. All organizations are required to comply with the HIPAA Privacy regulations, since Privacy involves safeguards from a people standpoint, but only those who store or transmit protected health information electronically are required to comply with the HIPAA Security regulations which is meant to protect electronic data. Once you know which regulations you need to comply with, then it is just a matter of knowing what you need to do to comply. What is involved in becoming HIPAA compliant? Part 1 is handled through our organizational training which allows you to roll out training to your employees as a self paced online training that they can each take at their own schedule. Our system trains, tests, and generates a 2 year certificate for compliance record keeping. Parts 2 and 3 are handled by our compliance documentation kits. At the same time your designated compliance officer is implementing the required documents, we are also training them through a "hands on learn by doing" approach. The theory behind our method is if your compliance officer built it, they will be able to maintain it going forward. If you already have parts of the 3 in place for HIPAA compliance, you can just purchase the components you need. How much will it cost to become HIPAA compliant? A typical ten person organization can become fully compliant at a cost of only $1,270. Note that this is worst case as some organizations will only have to comply with Privacy and not Security. Contact us and we'll be happy to discuss your particular needs. How long does it take to be become HIPAA compliant? On average, you are looking at about 2 to 2.5 weeks assuming half time for the compliance officer. The compliance officer will roll out the 1.5 hour Awareness training to the employees and then work on the documentation kits in parallel (1 week per kit). We have a pre-recorded jumpstart session where we walk you through the entire process so there is no guess work. We are also available for questions through the whole process at no additional charge. HIPAA requires that all employees be properly trained on HIPAA so that they can be aware of their personally responsibilities under HIPAA as well as help the organization protect the privacy and security of patient health information. Our Organizational Training is for an organization looking to train its employees on the HIPAA Privacy and HIPAA Security regulations in order to satisfy the training requirement under HIPAA and to provide as proof of proper training. All employees will take the Awareness training to satisfy the training requirement and then those employees who will be involved in implementing HIPAA Security (the IT part of HIPAA) compliance at your organization (compliance officer and IT staff), will take the additional HIPAA Security course. Our HIPAA Awareness training contains an overview of HIPAA Security for the average person where as the HIPAA Security course is a dedicated course on HIPAA Security and contains an extra level of regulatory detail for someone who has to be responsible for HIPAA Security. These online training courses are valid for all US states and territories and meet or exceed the requirements for HIPAA training established by the federal HIPAA Privacy and HIPAA Security regulations. How? Our training system is smart - very smart - and does almost everything for you. All you have to do is to email generic instructions to your staff. It is the same instructions for everyone and we’ve already pre-typed the instructions for you. Have staff that doesn’t have email? No problem, print it off and give it to them as a piece of paper. Once you provide the generic instructions to your staff you are done. The smart training system then takes over from there and trains, tests, generates certificates, emails you a copy of those certificates, and maintains a training log. It can’t get any easier. Our smart system utilizes a single shared multi-user login that eliminates the hassle of having to setup and manage multiple usernames and passwords. Everyone from your organization can log in from home or work (24x7) using the same shared login (no limit on simultaneous users). On passing the final exam, each individual is prompted to enter their name. The system then generates a PDF certificate for the individual and emails a copy of the certificate to the administrator for record keeping. The smart system maintains a detailed training log automatically for you. To take our organizational training courses, simply enter the number of training seats you need in the QTY OF SEATS field in the Online HIPAA Courses section below, and then click on the ADD TO CART buttons and then CHECKOUT to complete your registration. There are no contracts so you can just pay as you go. So in the future, you can simply add seats by logging in and clicking on an Add More Licenses link and recharge it like a phone card. 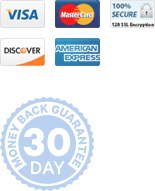 And we provide a cumulative pricing discount over the life of the account so it gets cheaper over time. Our HIPAA Awareness training course is meant to satisfy the training requirement under HIPAA and provides an emphasis on HIPAA Privacy but with an overview of the other parts of HIPAA such as HIPAA Security as well. 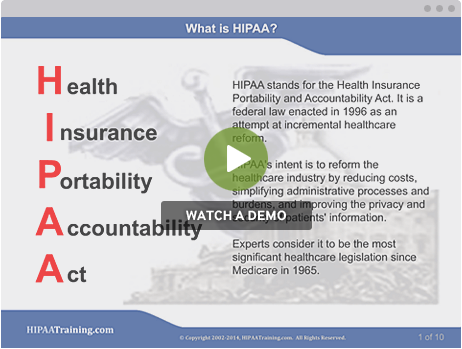 Everyone must take this course to satisfy the training requirement under HIPAA. Our HIPAA Security training course is a more indepth course on HIPAA Security (the IT part of HIPAA) and covers safeguards required to protect the security of protected health information in electronic form (computer data, networks, email, electronic transmissions, etc). This course is meant as a follow on course after the Awareness training for the HIPAA compliance officer, IT staff, or anyone else who will be involved in implementing HIPAA Security or who needs a more detailed understanding of HIPAA Security. If you are not going to be involved in or be responsible for HIPAA compliance at your organization then you only need the Awareness course where we provide an overview of HIPAA Security for the average person. The majority of employees will just take the Awareness course. Compliance and IT will take both. The Security course gets discounted to $20 when purchased with Awareness. HIPAA requires that formal documents and controls such as forms, contracts, policies and procedures, etc be in place for the organization to properly protect patient health information. Documents such as business associate contracts, policies and procedures, patient rights documents, breach notification, and others that you learn about in the Awareness training. Our Documentation Kits are meant to be utilized by your compliance officer to put in place the documents, contracts, forms, and policies and procedures required by the HIPAA Privacy and HIPAA Security regulations. At the same time they are putting that in place, we are training them as a new HIPAA compliance officer through a unique "Hands On Learn by Doing Approach". Our kits are very easy to use, come with a step by step to do list that walks you through the entire process, and provide ready to use templates in Microsoft Word format for easy download. Once you download the templates, they become your master copies on your local network/pcs and they are yours even beyond the 1 year online access. Finally we fully support you through the process, so if you have any questions, you can contact us anytime. If you are looking to purchase both the Documentation Kits and the Organizational Training, we recommend you purchase them as two separate purchases with their own unique login. That way you can have a separate login for the compliance officer that contains the kit(s) and a separate login for the employees to take their training. To purchase, simply click on the ADD TO CART button next to the kit(s) you wish to purchase. This documentation kit contains all the documents, forms, contracts, and policies and procedures needed for complying with the documentation requirements of the HIPAA Privacy regulations. This documentation kit contains all the documents, forms, contracts, and policies and procedures needed for complying with the documentation requirements of the HIPAA Security regulations. Online HIPAA Awareness and Security training sold separately. HIPAA requires that an organization designate someone as the HIPAA compliance officer to be responsible for HIPAA. This does not have to be a full time position and can be an additional duty for someone. The main responsibility of the HIPAA compliance officer will be to get the organization initially HIPAA compliant and then to maintain it and be a point person for questions or complaints. Training of a new HIPAA compliance officer is automatically handled as part of our documentation kits where we train a compliance officer through a unique "Hands On Learn by Doing Approach". For more information, click on the Documents and Controls box above. The Department of Health and Human Services is responsible for regulating HIPAA, but they have never come out with a training vendor certification process. So us and all the other vendors have just followed their guidelines. 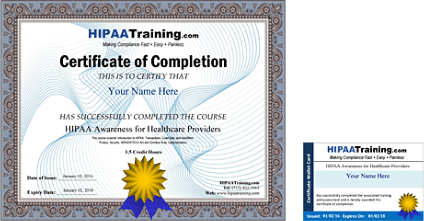 Given that, however, HIPAATraining.com has been in the HIPAA compliance space for over 14+ years and does full compliance not just training so our courses are very comprehensive and among the best out there. Yes HIPAA is a federal regulation so our certification is recognized nationwide in all US states and territories. If you are going to be responsible for HIPAA or you are IT staff that will be involved in implementing HIPAA Security compliance at your organization, then you want to take both the HIPAA Awareness and HIPAA Security courses. The HIPAA Security course contains more detailed regulatory information for someone who has to be responsible for HIPAA Security (the IT part of HIPAA). Yes we do. Choose the appropriate organizational category from the top products menu and go the Employee Training section. Yes you continue to receive the same discount level on additional seats. So if you bought 25 seats, your pricing would be $23.99 for those 25 seats and also for any future seats you purchased. Additionally, as you continue to purchase seats with us we continue to discount you down in pricing as you hit the new tiers. Yes there is no requirement you purchase everything. You can purchase just what you need. So if you already have documents for example, you can just purchase employee training. However, if you are trying to get an organization compliant just know you have to have those other parts to be HIPAA compliant as an organization. Who are the HIPAA Documentation Kits meant for? They are meant for the person designated as the HIPAA Privacy/Security/Compliance officer for your organization to help them implement HIPAA compliance at your organization. What is included in your HIPAA Compliance Documentation Kits? The documentation kits contain a 1 hour pre-recorded jumpstart session and a step by step to do list walking you through the entire HIPAA compliance process along with all the forms, policies and procedures, documents, etc needed to implement HIPAA compliance at your organization. All the documents are available in ready to use Microsoft Word format and are available for immediate download. 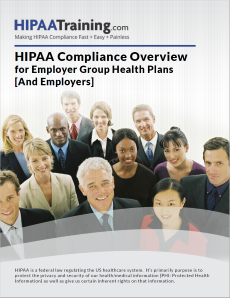 Is employee training included as part of your HIPAA Compliance Documentation Kits? Online training is sold separately from the documentation kits under our organizational training offering. This allows organizations to mix and match depending on their unique needs. Do I need the HIPAA Privacy Documentation Kit, HIPAA Security Documentation Kit, or both? Everyone needs to comply with HIPAA Privacy. So you would need the HIPAA Privacy Documentation Kit for sure. You only need HIPAA Security if your organization stores, maintains, or transmits protected health information electronically such as on computers. Since most organizations store protected health information on computers these days, most organizations will have to comply with HIPAA Security. If that applies to your organization, then you will need the HIPAA Security Documentation Kit. The only organizations that won't need the HIPAA Security Documentation Kit are those that do everything on paper. Why are the Documentation Kits so expensive? Many of our customers would ask why it is so cheap. We have taken the HIPAA regulations and made them extremely easy to implement without having to hire expensive legal counsel or consultants. Everything is in ready to use format with step by step instructions and include any help you need in getting through the process. Our pricing is a fraction of what it would cost to develop the documents yourself, with a lawyer or by hiring a consultant. Do I need any special qualifications to use the Documentation Kits? We've made the process extremely easy with step by step instructions and ready to use documents. However, you can contact us anytime through the entire process and we'll be happy to help.